Figure 1. The color zoning of amethyst from Boudi often displays a characteristic hourglass shape. Photo by Abdelghani El Harfi and Salahaddine Mouaddib. Amethysts from Boudi, Morocco, are characterized by double terminations and hourglass-shaped color zoning. This study provides infor­mation about the geology of the deposit, the mining of the material, and its internal and external features. Photos show the amethyst’s strong color zoning. Analysis of the needle-shaped mineral inclusions identified them as hematite, oriented along the crystal’s growth direction. For 25 years, the Moroccan locality of Boudi in the Tata province (part of the Guelmim-Es-Semara region) has yielded amethyst crystals that show double termination and hourglass-shaped color zoning (figure 1). The deposit was discovered in 1990, and for years the amethyst was extracted on a small scale by local villagers using handheld tools. Only small quantities were sold to tourists, and the low market value limited production. The first foreign mineral dealer to visit the location was Zee Haag in 2007. These specimens debuted internationally at the 2009 Mineral & Gem show at Sainte-Marie-aux-Mines, Europe’s second-largest mineral event. 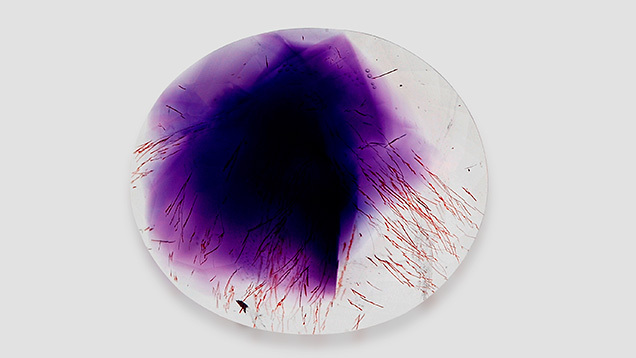 Since then, dealers and collectors have visited the site, and the deposit was featured in an extraLapis monograph on amethyst (Praszkier and Rakovan, 2012). In early 2012, the Geostone Group in Casablanca obtained exclusive rights to the mine (an open quarry, in accordance with Moroccan law). The company began production in early 2013, after building an off-road track to comply with environmental regulations. This article focuses on the geological setting of the deposit and the gemological features of the ame­thysts obtained from it. Figure 2. 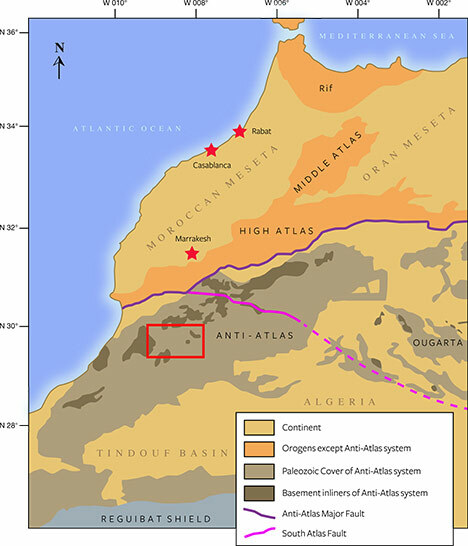 This map shows the location of the Boudi quarry (outlined in red), in the Anti-Atlas mountain range of Morocco. From Faik (2005). The village of Boudi (figure 2) is located in the arid Central Anti-Atlas mountain range, about 30 km northeast of the town of Tata. Boudi is accessed by taking National Road 12 for 40 km, followed by a sinuous 14 km road and a newly built off-road track for the final 4 km. 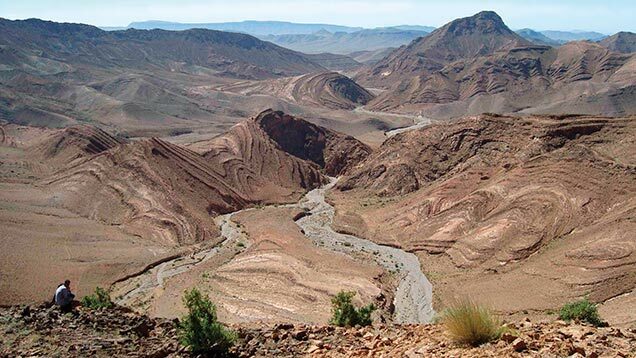 The region is mountainous, with an altitude ranging from 1,400 to 1,800 m, and set in a very arid and forbidding environment (figure 3). The mine is located 6 km east of the Tagragra Tata Precambrian basement, a kind of erosive depression on the crest of an anticline, similar to a tectonic window. Figure 4 shows a simplified geological map of the region; amethysts are found in the Lower Cambrian Issafen Formation (Faik et al., 2001; Faik, 2005). Figure 3. The area near Boudi is arid and rich in geological features. Photo by Abdelghani El Harfi and Salahaddine Mouaddib. Figure 4. A simplified geologic map of the area hosting the amethyst quarry. The Issafen Formation lies below the Limestone series of Lower Cambrian age and is not visible in the map. The red square indicates the mining area. From Faik (2005). The deposit is exposed along an eroded area on the south side of an anticline formed by rock of Cambrian age. It covers hundreds of square meters in a fractured area crossed by hydrothermal veins. The host rock is siltstone-sandstone belonging to the Issafen Formation of the Lower Cambrian, a schist formation composed of mudstone with marl and sandstone intercalations in the upper zone, dolomitic limestones (with stromatolites) in the middle, and purplish red mudstones in the lower part, again with intercalations of stromatolitic limestones and dolostones, all of these in stratigraphic contact. In the simplified geological map, the Issafen Formation is below the Schist-Limestone and Limestone series of Lower Cambrian age, and thus is not visible (again, see figure 4). At Boudi, quartz is found either scattered in a silt-sandstone matrix or within cavities of a complex fault and fractures system. Small openings are completely filled with interlocking quartz crystals. In the reddish mudstones, floating quartz specimens are always found as single crystals without matrix, usually singly terminated but sometimes doubly. The amethyst clearly formed by hydrothermal deposition, but the condition of the crystals suggests they were removed from the original site of crystallization and subsequently encapsulated in the mudstones. The deposit could be regarded, then, as both primary and secondary. The authors hypothesize that the well-shaped quartz crystals originated in the faults and veins in the surrounding limestone, and then eroded and redeposited in the residual mudstones. Figure 5. The front of the open quarry in Boudi. Photo by Abdelghani El Harfi and Salahaddine Mouaddib. Conditions are challenging due to the location’s remoteness, the hot summer temperatures, and the lack of water and electrical power at the mine. 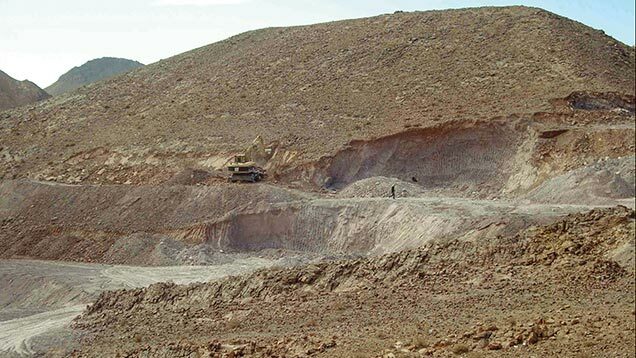 Since the beginning of 2013, the open pit has been worked by an excavator and a loader that easily remove the fractured limestone and mudstone containing scattered quartz crystals and fragments (figure 5). The miners come from Boudi, Targuant, and other surrounding villages, so the mine is an economic resource for the area. Figure 6 shows a selection of the production from the mine. Figure 6. The amethysts extracted from the piles are still covered with matrix and carbonates. The well-shaped crystals range from 2 to 5 cm in diameter. Photo by Abdelghani El Harfi and Salahaddine Mouaddib. 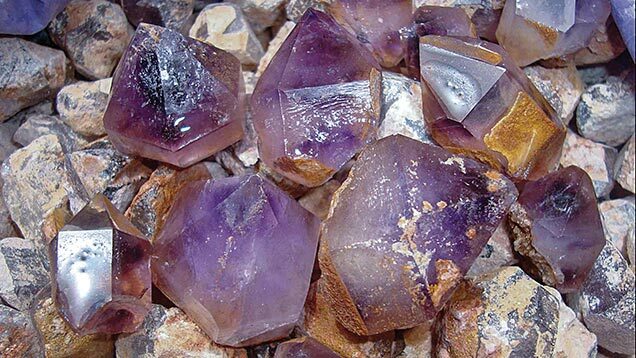 The quarried amethyst crystals vary in size, color, and quality. Four-wheel-drive vehicles carry the production to storage facilities. About 90% of the crystals are well formed and detach from the matrix as individual crystals. High-pressure washing with a brush and water gun removes the clays that cover the crystals. Encrusted crystals are soaked for a short time in a mixture of diluted hydrochloric acid to dissolve the residual limestone. Amethyst from Boudi displays a fairly typical morphology. The crystals have well-developed prism faces, and in some cases they present the double termination that characterizes the locality. Rhombohedral faces are well developed (figure 7). Euhedral crystals are common, ranging from 1 to 10 cm in length and rarely up to 15 cm. The highest-quality material is in the 1–5 cm range. The crystal faces are normally clean or coated by carbonates and clay minerals. Figure 7. This crystal from Boudi displays the classic morphology of amethyst. Clearly visible is the habit of the hexagonal prism and the two different rhombohedra (positive and negative). The hematite inclusions, mainly oriented perpendicular to the surface of the prism, are clearly visible in the outer colorless portion. Photo by Abdelghani El Harfi and Salahaddine Mouaddib. 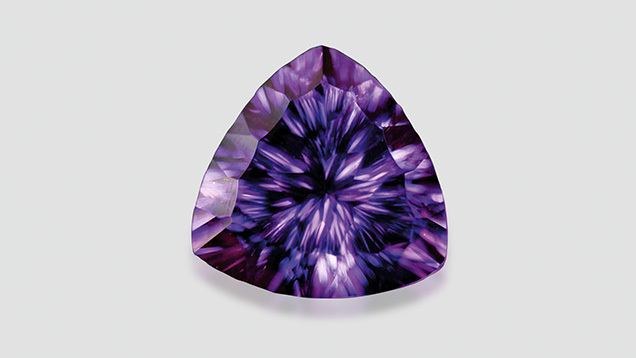 The color quality and distribution varies widely, from light purple to very deep purplish red, often showing sharp color concentration along the rhombohedral direction. The color concentration usually resembles a core, beyond which the quartz becomes colorless toward the surface. Abundant oriented, needle-like reddish inclusions are often found, mainly in the deeply colored stones. Color banding may also be evident in the deeply colored core, mostly oriented parallel to the rhombohedral crystal faces. The purple coloration of amethyst is caused by the presence of an interstitial Fe4+ color center in the quartz (Rossman, 1994), combined with irradiation from natural gamma-ray sources. Irradiation creates color centers that absorb some light wavelengths and produce the very attractive tone seen in this material. The hourglass zoning distinctive of the Boudi mine is created when the iron is incorporated preferentially along the rhombohedral faces. During the growth of the crystal, with the development of the face, the purple sector assumes its typical form. Figure 8. This suite of amethyst from Boudi, titled “Purple Champagne,” received first place in the 2014 AGTA Spectrum Awards, Pairs & Suites. Courtesy of Ai Van Pham Gem & Gold Creations, Scottsdale, Arizona. While most of the material produced is cabochon-grade, a consistent percentage—maybe 20%—is suitable for faceting. Most of the rough shows color zoning, which is often regarded as an unwanted feature but can be very attractive in the hands of skilled and creative gem cutters. This was the case with an award-winning suite recently cut from Boudi amethyst (figure 8). 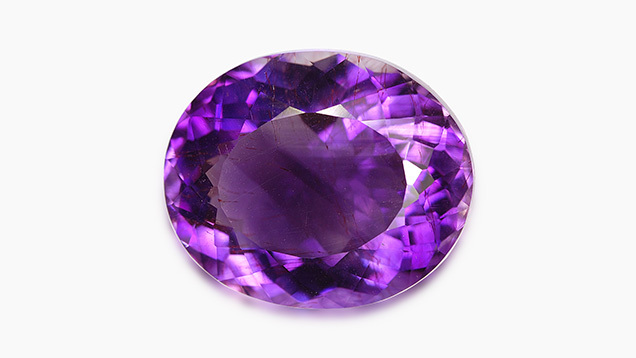 Both cabochon- and facet-grade material can display strong colors, and significant amounts of rough show a deep reddish purple color. The best crystals exhibit purple flashes with a red tinge. Faceting this deeply colored material can reveal strong red overtones; these stones are known in the trade as “Siberian” amethyst (Wise, 2005). Fine stones larger than 20 carats are regularly faceted, but most of the faceting material is in the 5–10 ct range. Cabochon-grade material up to 100 ct is common. 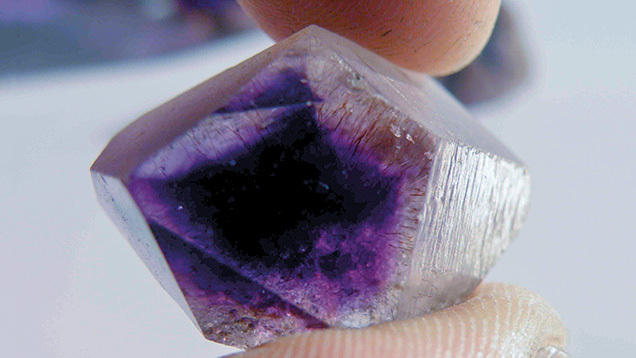 To date, we have not seen heat treatment applied to amethyst from Boudi, which is rarely dark enough to warrant it (Götze and Möckel, 2012; figure 9). Figure 9. This 22.5 ct faceted trilliant is from the Boudi quarries. Photo by Abdelghani El Harfi and Salahaddine Mouaddib. Gemological properties of 20 faceted amethysts supplied by the Geostone Group were analyzed using standard gem testing instruments. The samples were representative of the material produced from this locality in both their color (light pinkish purple to dark reddish purple) and size range (6.06–17.92 ct). Refractive indices and birefringence values were obtained with a standard refractometer and a near-monochromatic light source. Specific gravity was determined using a Mettler-Toledo hydrostatic meter. Reactions to ultraviolet radiation were observed using standard long-wave (365 nm) and short-wave (254 nm) lamps. Visible absorption spectra were obtained with a Krüss prism spectroscope. Visual features were observed using an SZM-2 zoom microscope from Gemmarum Lapidator with darkfield illumination at 20×–80× magnification. Inclusions were photographed with an Olympus BX41 microscope using immersion techniques. Chemical composition data were obtained with semi-quantitative, non-destructive EDS microanalysis for determination of major and minor elements. Micro-Raman spectroscopy was used for mineral inclusion identification purposes. EDS data were acquired at Turin University’s Department of Earth Science using a Cambridge Stereoscan 360 scanning electron microscope, equipped with an Oxford Inca Energy 200 EDS for microanalysis and a Pentafet detector and an ultrathin window for the determination of elements with atomic number down to boron. All spectra were obtained at 15 kV accelerating voltage, 25 mm working distance, and 1 µA probe current for 60 to 300 seconds. Primary standardization was performed on SPI Supplies and Polaron Equipment analytical standards. Daily standardization was performed on a high-purity metallic cobalt standard. Unoriented micro-Raman spectra were obtained at Turin University with a HoribaJobin Yvon LabRam HRVIS apparatus, equipped with a motorized x-y stage and an Olympus microscope. The backscattered Raman signal was collected with a 50× objective, and the Raman spectrum was obtained for a non-oriented position. The 632.8 nm line of a He-Ne laser was used as the excitation wavelength; laser power was controlled by a series of density filters. The minimum lateral and depth resolution was set to a few µm. The system was calibrated using the 520.6 cm–1 Raman band of silicon before each experimental session. The spectra were collected in 8 to 10 acquisitions with single counting times ranging between 40 and 120 seconds. Spectral manipulation such as baseline adjustment, smoothing, and normalization were performed using the LabSpec 5 software package (HoribaJobin Yvon, 2004 and 2005). For band component analysis, we used the Fityk software package (Wojdyr, 2010), which enabled us to select the type of fitting function and fix or vary specific parameters accordingly. The spectra were recorded for the 100–1300 cm–1 range using the LabSpec 5 program. The refractive indices of the 20 amethyst samples from Boudi varied from 1.540 to 1.542 (o-ray) and 1.549 to 1.552 (e-ray), with birefringence from 0.009 to 0.010. Pleochroism, observed with a calcite dichroscope, varied from weak to medium bluish purple to reddish purple. None of the samples showed any reaction to either short- or long-wave UV radiation. No absorption spectra were observed using the Krüss spectroscope. Figure 10. This amethyst sample weighs 17.94 ct. Clearly visible in the magnified inset is a veil consisting of one- and two-phase inclusions. Photo by Emanuele Costa and Fabrizio Troilo. Fluid inclusions with a veil-like pattern (figure 10) were common in the amethyst samples from Boudi. Individual fluid inclusions sometimes showed a moderate negative crystal form. Some of these inclusions had a two-phase character, with liquid and gas components. Figure 11. 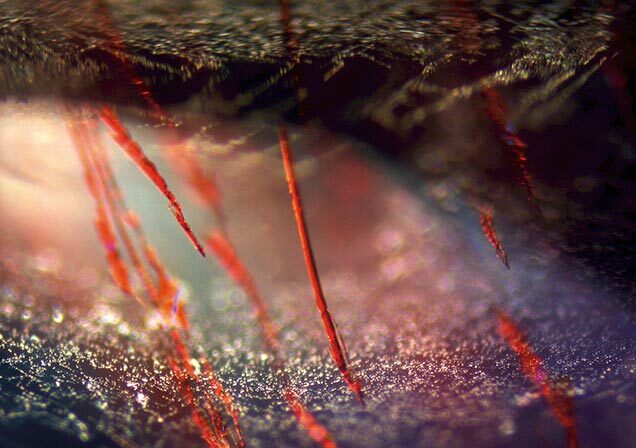 Microscopic observation reveals the red hematite inclusions. Photo by Emanuele Costa and Fabrizio Troilo, field of view 210 mm. The red, elongated solid inclusions were also the most interesting internal features and could be observed in almost every specimen analyzed (figure 11). The crystals’ near-colorless zones were permeated by a series of fibrous red inclusions, approximately oriented from the different crystal faces toward the colored core, in which they gradually disappeared. The orientation of the tiny fibers was not crystallographic, but the general distribution of the fibers followed the crystal growth direction (figures 12 and 13). The needles had different lengths, but their diameters were quite consistent. Their microscopic appearance showed a morphology that seemed less angular and fragmented and more straight and continuous than the hematite “beetle leg” inclusions (once believed to be lepidocrocite) reported in the literature (Hyršl and Niedermayr, 2003; Leon-Reina et al., 2011). Figure 12. A 9.14 ct faceted amethyst from Boudi displaying red hematite needle inclusions. Photo by Emanuele Costa and Fabrizio Troilo. 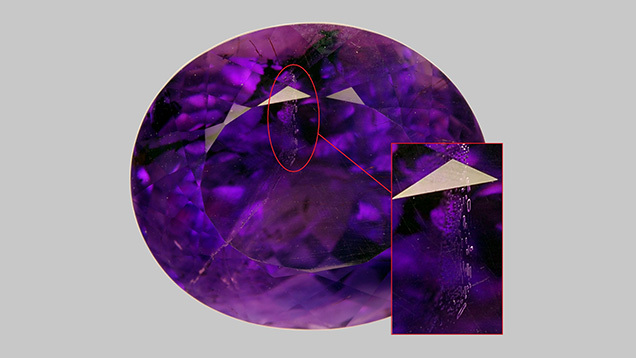 These inclusions distinguish the material from synthetic amethyst, and their distribution and orientation within the stone could help to identify their origin as the Boudi deposit. To the best of our knowledge, such inclusions have not been described in detail until now. Figure 13. This 14.30 ct sample, viewed in immersion, clearly shows the distribution of the hematite inclusions, together with the uneven but distinct zoning of the purple color. Photo by Emanuele Costa and Fabrizio Troilo. The nature of the inclusions was confirmed by EDS and Raman analysis. The EDS spectra showed only the presence of silicon and oxygen (from the host quartz crystal) as well as iron, but it was impossible to discriminate between various iron oxides and hydroxides. Raman analysis (figure 14) showed a close match between the obtained spectrum and those of quartz (R040031) and hematite (R050333) in the RRUFF database (Downs, 2006). Visible in detail were the typical intense band of quartz around 467 cm–1 and weak broad bands at 132, 209, 359, and 811 cm–1. Additionally, the distinctive bands of hematite inclusions were observed. 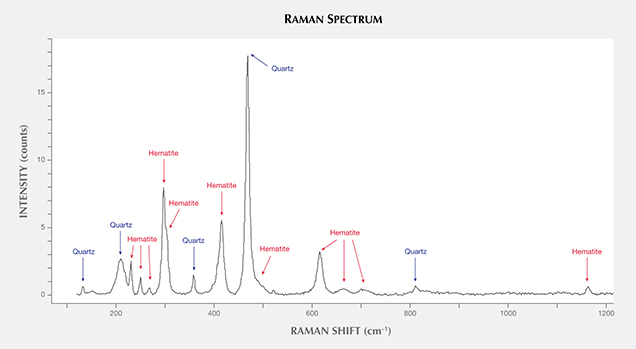 The Raman spectrum showed an intense band at around 299 cm–1, with a weak shoulder at 302 cm–1; multiple bands at 231, 251, and 267 cm–1; medium-intensity bands at 413 and 619 cm–1; and weak peaks at 490 (a shoulder of the most intense band of quartz), 664, 703, and 1160 cm–1. Figure 14. This Raman spectrum clearly indicates the peaks of hematite in the quartz matrix. The Boudi quarry in the Anti-Atlas mountain range of Morocco was worked for more than 20 years in a largely artisanal and sporadic manner. Since 2014, mechanized mining has produced commercial quantities of amethyst for the jewelry industry. The deposit also yields amethyst with deep red tones that rival the highly sought “Siberian” material (Wise, 2005). The color of the stones varies, but a considerable quantity exhibits a deep purplish red color. Moreover, singular internal features distinguish the material’s natural origin (about 50% of the stones have distinctive red needle hematite inclusions, typically observed in stones with deep color). 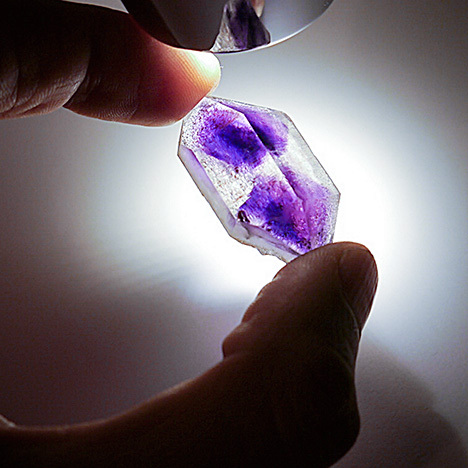 Production is likely to expand, which means the gem market could see more of this amethyst. Mr. Troilo is a geologist and graduate gemologist from the Istituto Gemmologico Italiano. He has published works about gemstone mining abroad as well as gemstone deposits in the Alps. Dr. El Harfi is professor of geodynamics in the geology department of Ibn Zohr University in Agadir, Morocco. Mr. Mouaddib is CEO at Geostone Group in Casablanca, Morocco (www.moroccanfire.com). Dr. Bittarello is a PhD geologist graduate at Turin University in Italy and an expert in mineralogical analysis. Dr. Costa (emanuele.costa@unito.it) is researcher and professor in biomineralogy and environmental geochemistry in the earth sciences department at Turin University. The authors would like to thank the reviewers for their helpful and constructive observations and suggestions, and the Geostone Group for providing the samples used in this study. Anderson B.W., Jobbins E.A. (1990) Gem Testing. Butterworths, 360 pp. Downs R.T. (2006) The RRUFF Project: an integrated study of the chemistry, crystallography, Raman and infrared spectroscopy of minerals. Program and Abstracts of the 19th General Meeting of the International Mineralogical Association in Kobe, Japan. O03-13. Faik F. (2005) Lithostratigraphie et structure de l’Anti-Atlas centre-occidental : du rifting fini-protérozoïque a l’orogenèse hercynienne. Master’s thesis, Ibn Zohr University, Agadir, Morocco, 176 pp. Faik F., Belfoul M.A., Bouabdelli M., Hassenforder B. (2001) Les structures de la couverture Néoprotérozoïque terminal et Paléozoïque de la région de Tata, Anti-Atlas centre-occidental, Maroc: Déformation polyphasée, ou interactions socle/couverture pendant l’orogenèse hercynienne? Journal of African Earth Sciences, Vol. 32, No. 4, pp. 765–776, http://dx.doi.org/10.1016/S0899-5362(02)00053-2. Gotze J., Mockel R (2012) Quartz: Deposits, Mineralogy and Analytics. Springer, Berlin, 377 pp. Horiba Jobin Yvon GmbH (2004, 2005) LabSpec [Software for Raman spectroscopic data analysis, acquisition and manipulation]. Version 5.64.15. Hyršl J., Niedermayr G. (2003) Magic World: Inclusions in Quartz. Bode Verlag, Haltern, Germany 240 pp. Leon-Reina L., Compana J.M., De la Torre A.G., Moreno R., Ochando L.E., Aranda M.A.G. (2011) Powder diffraction analysis of gemstone inclusions. Powder Diffraction, Vol. 26, No. 1 pp. 48–52, http://dx.doi.org/10.1154/1.3552672. Praszkier T., Rakovan J. 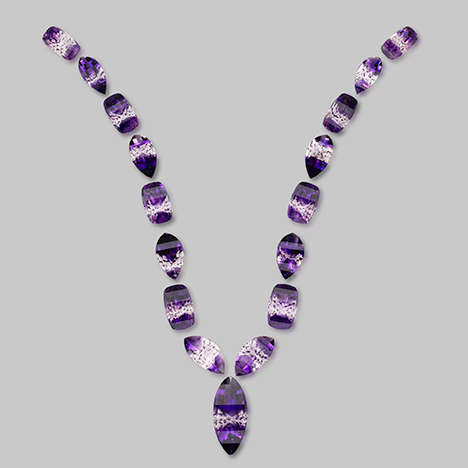 (2012) Hourglass figures – Bou Oudi amethyst. In H.A. Gilg, S. Liebetrau, G.A. Staebler, and T. Wilson, Eds., Amethyst: Uncommon Vintage, No. 16, Lithographie, Ltd., Denver, Colorado, pp. 102–105. Rossman G.R. (1994) Colored varieties of the silica minerals. In P.J. Heaney, C.T. Prewitt, and G.V. Gibbs, Eds., Silica: Physical Behavior, Geochemistry, and Materials Applications. Reviews in Mineralogy, Vol. 29. Mineralogical Society of America. pp. 433–468. Wise R.W. (2005) Secrets of the Gem Trade: The Connoisseur's Guide to Precious Gemstones. Brunswick House Press, Lenox, MA. Wojdyr M. (2010) Fityk: a general-purpose peak ﬁtting program. Journal of Applied Crystallography, Vol. 43, No. 5, pp. 1126–1128, http://dx.doi.org/10.1107/S0021889810030499. Explore amethyst history, research, quality factors, and more in the GIA Gem Encyclopedia. Test your knowledge of our 2014 content by taking our annual Challenge.